Description: Are you just getting into Spey Casting? Or looking to fine tune some of your basic skills? 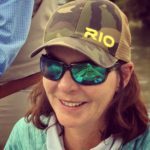 Whitney Gould Fly Fishers International certified two-hand casting instructor and North Western US Guide will be hosting a day long class covering the fundamentals of Spey Fishing for trout. She will discuss what gear is right for each situation from reels & rods to flies & lines she touches on it all. That’s not it! Whitney will take participants to the “Bunny Ranch” section of the Middle Provo River where she will showcase Spey casting basics such as lift, set and forward stroke optimizing distance and presentation. Making the most out of every cast and covering a significantly larger section of water. Don’t delay on this amazing opportunity to Spey Cast with one of the best guides in the Western US. This will be an all-day On-The Water class at a location on the Provo River. Lunch is included.